https ://3eee22abda47 .faith/nvidia4.dvr (VirusTotal 11/61)... DO NOT follow the advice they give to enable macros or enable editing to see the content... The basic rule is NEVER open any attachment to an email, unless you are expecting it..."
June 27, 2017 - "... a new malware variant has surfaced..."
Edited by AplusWebMaster, 27 June 2017 - 02:49 PM. Showing a high level of encryption that at this time appears unable to be decrypted without paying the ransom. indexsa.com .ar > 190.183.59.228 ..."
-ransomware- targeting Windows hosts... Today I collected 11 Blank Slate emails, so this diary examines recent developments from the Blank Slate campaign. Today's Blank Slate malspam was pushing Cerber and GlobeImposter ransomware... -fake- Chrome pages sent victims zip archives containing malicious .js files designed to infect Windows hosts with ransomware... potential -victims- must open the zip attachment, open the enclosed zip archive, then double-click the final .js file. That works on default Windows configurations..."
Update 6/28 08.00 GMT+3 - "There is mounting evidence that the #GoldenEye / #Petya ransomware campaign might not have targeted financial gains but rather data destruction..."
Edited by AplusWebMaster, 29 June 2017 - 02:16 PM. http ://pilotosvalencia .com/sergollinhols.png which of course is -not- an image file but a -renamed- .exe file that gets renamed to fsrtat.exe and autorun (VirusTotal 14/60***)... DO NOT follow the advice they give to enable macros or enable editing to see the content... The basic rule is NEVER open any attachment to an email, unless you are expecting it..."
Payment Dunmore 27.26.170001.jar (566kb) - Current Virus total detections 12/58*. MALWR**... The basic rule is NEVER open any attachment to an email, unless you are expecting it..."
Edited by AplusWebMaster, 05 July 2017 - 12:44 PM. This email attachment contains what appears to be a genuine word doc -or- Excel XLS spreadsheet with either a macro script -or- an embedded OLE object that when run will infect you... DO NOT follow the advice they give to enable macros or enable editing to see the content... The basic rule is NEVER open any attachment to an email, unless you are expecting it..."
Edited by AplusWebMaster, 06 July 2017 - 04:52 AM. http ://mutfakdolabisitesi .com/grandsergiostalls.png which of course is -not- an image file but a renamed .exe file that gets renamed to qkY5ijY.exe and autorun (VirusTotal 12/64***)... The basic rule is NEVER open any attachment -or- link in an email, unless you are expecting it..."
Edited by AplusWebMaster, 07 July 2017 - 02:53 PM. As well as encrypting the usual image, music, video and document files this also encrypts databases files, email, and very unusually many executable file types. It also encrypts your bitcoin wallet and other similar financial files... The basic rule is NEVER open any attachment to an email, unless you are expecting it..."
The sender domain is also the C2 http ://joelosteel .gdn/pi.php currently hosted by digitalocean .com on 165.227.1.206 ..."
autorun (VirusTotal 10/63***)... DO NOT follow the advice they give to enable macros or enable editing to see the content... The basic rule is NEVER open any attachment to an email, unless you are expecting it..."
Edited by AplusWebMaster, 10 July 2017 - 06:28 AM. Edited by AplusWebMaster, 11 July 2017 - 03:42 PM. http ://kgshrestha .com.np/geroi.png ... DO NOT follow the advice they give to enable macros or enable editing to see the content... The basic rule is NEVER open any attachment to an email, unless you are expecting it..."
http ://kgshrestha .com.np/sergiano.png ... DO NOT follow the advice they give to enable macros or enable editing to see the content... The basic rule is NEVER open any attachment to an email, unless you are expecting it..."
TT COPY MBUNDU GISA 740,236 USD.jar - Current Virus total detections 2/59. Payload Security... The basic rule is NEVER open any attachment to an email, unless you are expecting it..."
Edited by AplusWebMaster, 18 July 2017 - 06:03 AM. doc00042714507507789135.zip extracts to: doc000799723147922720821.vbs - Current Virus total detections 9/57*. http ://pluzcoll .com/56evcxv? which is converted to nbVXsSxirbe.exe (VirusTotal 31/63***)... DO NOT follow the advice they give to enable macros or enable editing to see the content... The basic rule is NEVER open any attachment to an email, unless you are expecting it..."
today we have seen 3 different campaigns and subjects all eventually leading to the same Trickbot payload..."
2017-07-19 - "... yesterday, I found a -bot- searching for... interesting files: configuration files from popular tools and website private keys. Indeed, file transfer tools are used by many webmasters to deploy files on web servers and they could theoretically leave juicy data amongst the HTML files... Each file was searched with a different combination of lower/upper case characters... This file could contain references to hidden applications (This is interesting to know for an attacker)..."
7/18/2017 - "A data leak at Dow Jones & Co. exposed the personal information of millions of customers after a public cloud configuration error. This marks the fifth major public cloud leak in the past several months after similar incidents affected Verizon, the WWE, US voter records, and Scottrade. This mistake compromised millions of customers' names, account information, physical and email addresses, and last four digits of credit card numbers. It also affected 1.6 million entries in Dow Jones Risk and Compliance, a collection of databases used by financial companies for compliance with anti-money laundering regulations. 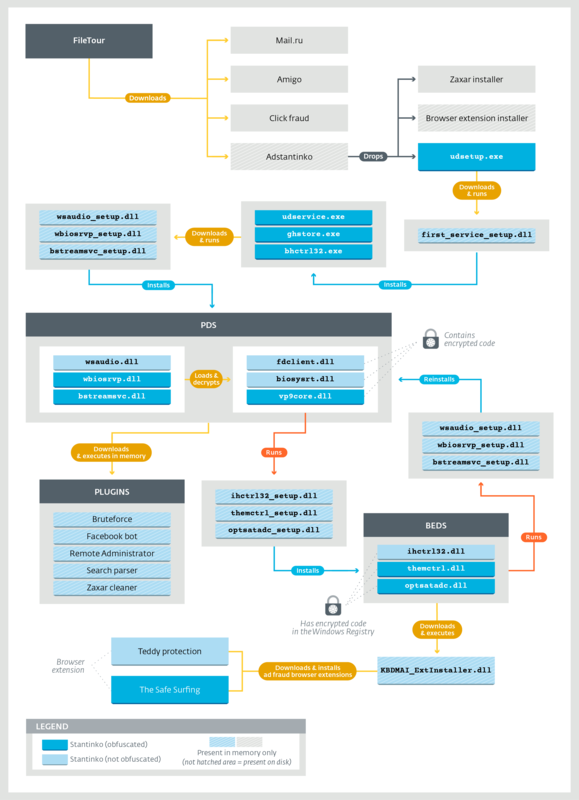 All of this information was left exposed in an Amazon Web Services S3 bucket, which had its permission settings configured to let any AWS Authenticated User download data using the bucket's URL. Amazon defines "authenticated user" as anyone who has a free AWS account, meaning the data was available to more than one million users... Dow Jones has confirmed 2.2 million people were exposed. Based on the repository's size and composition, Upguard "conservatively estimates" up to four million people could have been affected, though it states* duplicated subscriptions may account for some of the difference. The publisher has "no reason to believe" any of the data was stolen..."
Edited by AplusWebMaster, 19 July 2017 - 12:29 PM. The page tries initially to automatically download 14407456340-60.pdf.exe (VirusTotal 3/64*). Edited by AplusWebMaster, 21 July 2017 - 04:16 AM. aprendersalsa .com/nhg67r? – artegraf .org/nhg67r? – asheardontheradiogreens .com/nhg67r? Thanks to Racco42 who has found the download sites and payload - PasteBin. July 21, 2017 - "ESET* researchers have unearthed a botnet of some 500,000 infected machines engaged mostly in ad-related fraud by using malicious Chrome extensions, but also Facebook fraud and brute-forcing Joomla and WordPress websites..."
20 Jul 2017 - "... a huge botnet that they monetize mainly by installing malicious browser extensions** that perform ad injection and click fraud. However, they don’t stop there. The malicious Windows services they install enable them to execute anything on the infected host. We’ve seen them being used to send a fully featured backdoor, a bot performing massive searches on Google, and a tool performing brute-force attacks on Joomla and WordPress administrator panels in an attempt to compromise and potentially resell them. ... Stantinko stands out in the way it circumvents antivirus detection and thwarts reverse engineering efforts to determine if it exhibits malicious behavior. To do so, its authors make sure multiple parts are needed to conduct a complete analysis. There are always -two- components involved: a loader and an encrypted component. The malicious code is -concealed- in the encrypted component that resides either on the disk or in-the-Windows-Registry. This code is loaded and decrypted by a benign-looking executable. The key to decrypt this code is generated on a per-infection basis. Some components use the bot identifier and others use the volume serial number from its victim PC’s hard drive. Making reliable detections based on the non-encrypted components is a very difficult task, since artifacts residing on the disk do not expose malicious behavior until they’re executed. Moreover, Stantinko has a powerful resilience mechanism. After a successful compromise, the victim’s machine has two malicious Windows services installed, which are launched at system startup. Each service has the ability to reinstall the other in case one of them is deleted from the system. Thus, to successfully uninstall this threat, both services must be deleted at the same time. Otherwise, the C&C server can send a new version of the deleted service that isn’t detected yet or that contains a new configuration..."
Edited by AplusWebMaster, 21 July 2017 - 03:21 PM. The Weather Company, the IBM-owned operator of weather .com and intellicast .com, is among the companies affected. Fusion Media Group, parent company of Gizmodo, The Onion, Jezebel, Lifehacker, and other properties made the same mistake... The companies that leaked data accidentally chose the sharing setting 'public on the Internet', which enabled -anyone- on the Web to access -all- information contained in their messages. RedLock advises all companies using Google Groups to ensure 'private' is the sharing setting** for 'Outside this domain-access to groups'. RedLock's CSI team routinely checks various cloud infrastructure tools for threat vectors, and monitors publicly available data to detect misconfigurations that could cause security incidents..."
It -cannot- help the victims of pirated Petyas, like PetrWrap or EternalPetya (aka NotPetya)..."
Edited by AplusWebMaster, 25 July 2017 - 01:21 PM. May-July2017.zip: Extracts to: QPX_ 18941124638_411385.wsf - Current Virus total detections 4/57*. Payload Security** downloads from dodawanie .com/?1 (or one of the other stage 2 sites listed in this pastebin (VirusTotal 5/577) (Payload Security) which -cannot- examine the file because it is seen as txt. However that downloads of an encrypted file from one of the stage 3 sites listed in this pastebin report which is converted by the script to an .exe file (VirusTotal 17/63) (Payload Security)... The basic rule is NEVER open any attachment to an email, unless you are expecting it..."
... Cisco's Martino says targeted cybersecurity -education- for employees can help prevent users from falling for BEC -and- ransomware attacks. The finance department could especially benefit from security training on phishing campaigns, so when the bogus-email comes across the transit of the CEO asking for a funds transfer it can be detected... Regular software patching also is crucial. When spam-laden-malware hits or ransomware attacks similar to WannaCry surfaces, the impact can be minimized... a balanced defensive and offensive posture, with not just firewalls and antivirus but -also- including measures to hunt down possible attacks through data collection and analysis..."
Edited by AplusWebMaster, 26 July 2017 - 11:22 AM. GOCNX8263762.doc - Current Virus total detections 7/57*. Payload Security** shows a download from one of the sites listed below where a random named .exe is delivered (VirusTotal 13/62[/3]) (Payload Security). Edited by AplusWebMaster, 27 July 2017 - 05:12 AM. http ://macsys.ca/ZQRZCy/ but... there are others. Associated URLs: http ://okdomvrn .ru/98wugf56? Edited by AplusWebMaster, 01 August 2017 - 07:12 AM. Update: it appears that this is more likely to be Globeimposter ransomware* not Emotet. It looks like I was mislead by initial detections on VirusTotal and the delivery method. 2nd Update 2 August 2017: This campaign has continued on and off all night (UK time) with a slight change to the zip file names. From exactly midnight UK time last night the last part of the zip name ( the date) changed from VM#######_20170801.zip to VM#######_20170802.zip. Looking through a few of the nearly 600 I received, it looks like the download sites are the -same- as many of the sites in yesterday’s (and earlier) Trickbot and globeimposter campaigns that I didn’t report on because of other real world commitments. A list of sites can be seen in VT comments**. Just change /98wugf56 to /JHghjHy6 (quite a few sites are live using the latest file name format). Edited by AplusWebMaster, 02 August 2017 - 04:16 AM. Edited by AplusWebMaster, 02 August 2017 - 01:19 PM. The word doc attachment looks like this and tells you to use the non existent passphrase to open it. The blue moving circle makes you think that you need to enable the content & macros to see the hidden secure content. ... these emails use Social engineering tricks to persuade you to open the attachments or follow links in emails..."
Edited by AplusWebMaster, 03 August 2017 - 05:57 AM. http ://karizma-co .com/wp-admin/user/Beneficiary%27s Details.R01 (VirusTotal 0/65) (almost certainly a compromised WordPress website) where a zip file is downloaded. Payload Security... The basic rule is NEVER open any attachment -or- link in an email, unless you are expecting it..."
Edited by AplusWebMaster, 14 August 2017 - 03:26 PM. http ://cfai66 .fr/nothing44.png ... DO NOT follow the advice they give to enable macros or enable editing to see the content... The basic rule is NEVER open any attachment to an email, unless you are expecting it..."
Locky ransomware returns - two new "flavors"
-never- assume Locky is gone simply because it’s not active at a particular given time..."
Graphically, the different pages are very clean and use components from the Paypal website to reproduce a look and feel very close to the official pages... There is also a second check of the IP address included in the PHP code. If a valid IP address or User-Agent is detected, an HTTP error 404 (page not found) is returned... 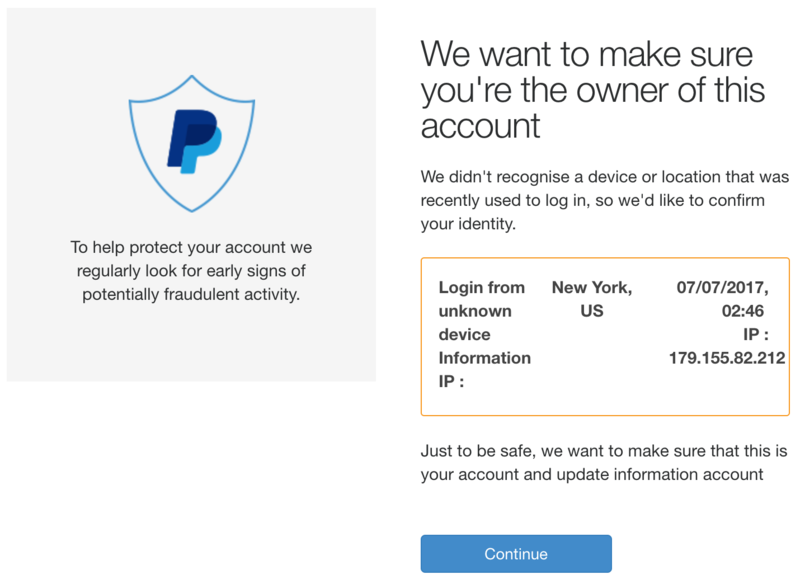 When the verification screens are displayed to the victim, fields are prefilled with the extracted information from Paypal. This is really evil! All fields are also validated to prevent garbage and increase the change to capture real data. Depending on the card number that the victim provided, a next screen is presented to fill bank details. Based on the source code, three countries are targeted: US, CA and UK. 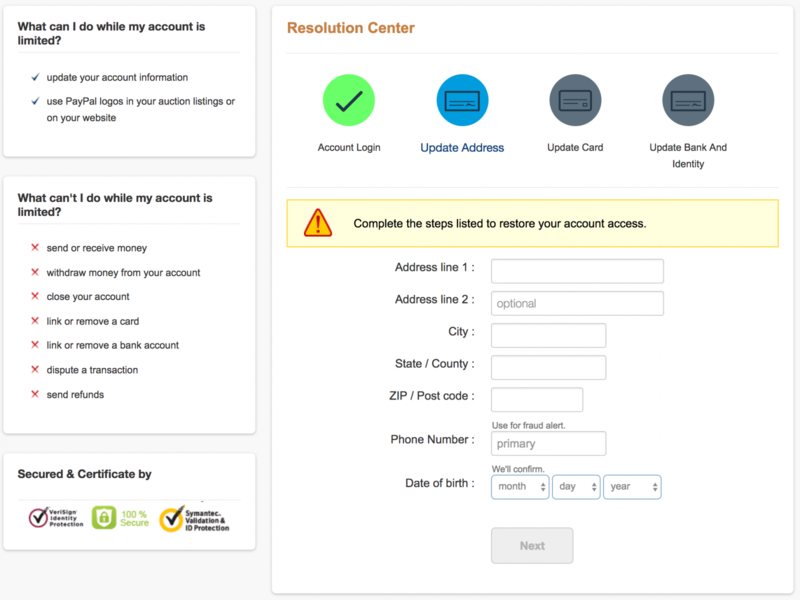 Depending on the bank, specific forms are displayed to request valid connection details... At the end of the “verification process”, an email is sent to the attacker with all the victim's details. The destination is a gmail .com account... 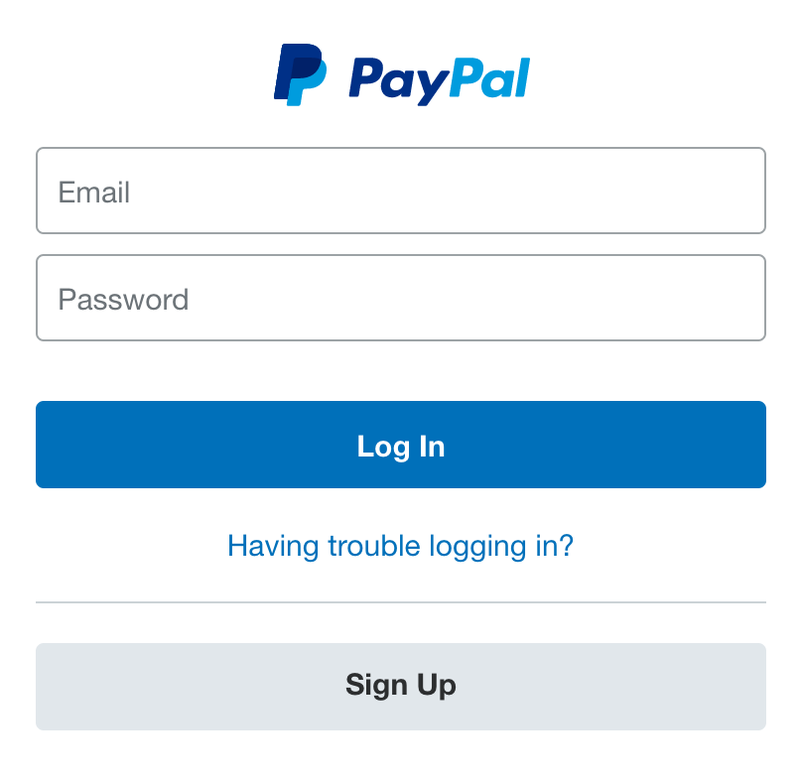 If most phishing kits remain simple and can be easily spotted by the victims, some of them are really well developed and harder-to-catch, especially if the URL used is nicely chosen and distributed via HTTPS. This kit was huge with more than 300 files in a 1.8MB ZIP file. Take care!" Edited by AplusWebMaster, 16 August 2017 - 01:34 PM. where a zip file containing a .js file is downloaded. 056757.doc - Current Virus total detections 15/58*. Payload Security**. http ://campingtossa .com/87wifhFsdf (VirusTotal 23/63***). Edited by AplusWebMaster, 17 August 2017 - 06:33 AM. - Current Virus total detections 6/55. Payload Security. which currently gives me a 404 on the entire domain although it does have registration details from 2015. The basic rule is NEVER open any attachment -or- link in an email, unless you are expecting it... -Never- attempt to open a zip directly from your email, that is a guaranteed way to get infected... just delete the unexpected zip and not risk any infection..."
8/17/2017 - "... 'One of the most critical things a user can do to protect themselves is to use a unique password for every site and never reuse passwords across multiple sites', the report* states... Attackers -frequently- compromise cloud services like Azure to enter a business and weaponize virtual machines so they can launch attacks like spam campaigns, brute force attacks, phishing, and port scanning..."
Edited by AplusWebMaster, 18 August 2017 - 09:37 AM. 21 Aug 2017 - "I only have a couple of samples of this spam, but I suspect it comes in many different flavours.. The word doc when opened [ and -if- you are unwise enough to enable macros ] will drop an encoded/obfuscated PowerShell script that has several obfuscated hard coded URLs inside it which download the actual Emotet banking Trojan. These do need quite a bit of decoding to get to the payload. http ://ohleronline .com/qnhvqLeGds/ > Could not find an IP address for this domain name. Analysis reports: Note the binaries update at frequent intervals during the day (time of the malware campaign) so you will get -different- versions/file hashes from those mentioned here." Edited by AplusWebMaster, 22 August 2017 - 03:54 AM. The script has a VirusTotal detection rate of 14/59*. A -ransomware- component is dropped (probably Locky) with a detection rate of 16/64." http ://pfsmoney .com/logo.png which of course is -not- an image file but a renamed .exe file that gets renamed to vgjqlt.exe and autorun (VirusTotal 13/65***). Payload Security**... The basic rule is NEVER open any attachment to an email, unless you are expecting it..."
Edited by AplusWebMaster, 22 August 2017 - 01:33 PM. 23 Aug 2017 - "... an email with the subject of 'RFQ072017' coming from Stafford Shawn <staffordshawn1@ yahoo .com> (possibly random senders) but definitely coming via Yahoo email network with a zip attachment containing a file that pretends to be a pdf file but is an .exe file... All detections on VirusTotal are heuristic or generic detections but it is quite well detected. Payload Security** - delivers /REjhb54 (VirusTotal ***)... The basic rule is NEVER open any attachment to an email, unless you are expecting it..."
Edited by AplusWebMaster, 23 August 2017 - 09:33 AM. A -link-in-the-email- downloads a malicious VBS script, and because it's quite late I'll just say that Hybrid Analysis* has seen it all before. The download EXE (VT 21/64**) script POSTS to 5.196.99.239 /imageload.cgi (Just Hosting, Russia) which is in a network block that also had a fair bit of Angler*** last year, so I would recommend blocking all traffic to 5.196.99.0/24." http ://enyahoikuen .com/serca.png ... DO NOT follow the advice they give to enable macros or enable editing to see the content... The basic rule is NEVER open any attachment to an email, unless you are expecting it..."
bill-201708.zip: Extracts to: bill-201708.exe - Current Virus total detections 19/65*. Payload Security**. Edited by AplusWebMaster, 25 August 2017 - 11:53 AM. 25 Aug 2017 - "This -fake- Sage invoice leads to Locky ransomware. Quite why Sage are picked on so much by the bad guys is a bit of a mystery. The link-in-the-email downloads a malicious RAR file. The samples I saw were closely clustered alphabetically. 25 Aug 2017 - "The jumble of numbers in this spam is a bit confusing. Attached is a malicious RAR file that leads to Locky ransomware. Attached is a RAR file containing a malicious VBS script. The scripts are all slightly different, meaning that the RARs are too... The VBS script is similar to this* (variable names seem to change mostly) with a detection rate of about 15/59**. Hybrid Analysis*** shows it dropping a Locky executable with a 18/65 detection rate which phones home to 46.17.44.153 /imageload.cgi (Baxnet, Russia) which I recommend that you block." Edited by AplusWebMaster, 25 August 2017 - 09:18 AM. Edited by AplusWebMaster, 27 August 2017 - 06:56 AM. On August 22, Proofpoint researchers detected an email campaign targeted primarily at Healthcare and Education involving messages with a Microsoft Word document containing an embedded executable... Defray may cause other general havoc on the system by -disabling- startup recovery and -deleting- volume shadow copies. On Windows 7 the ransomware monitors and kills running programs with a GUI, such as the task manager and browsers. We have not observed the same behavior on Windows XP..."
Aug 28, 2017 - "US-CERT warns users to remain vigilant for malicious cyber activity seeking to capitalize on interest in Hurricane Harvey. Users are advised to exercise caution in handling any email with subject line, attachments, or hyperlinks related to Hurricane Harvey, even if it appears to originate from a trusted source. Fraudulent emails will often contain links or attachments that direct users to phishing or malware-infected websites. Emails requesting donations from duplicitous charitable organizations commonly appear after major natural disasters..."
Edited by AplusWebMaster, 28 August 2017 - 02:37 PM. 29 Aug 2017 - "We see a lot of Amazon phishing attempts. This one is quite different to the usual ones we see. Although there are a lot of Amazon sellers, the chances of a mass malspam like this one actually being received by a seller is quite small compared with the more usual 'payment review' or 'your account was signed into from an unknown computer' or similar scams. You then get -redirected- to the genuine Amazon suite for your country..."
Edited by AplusWebMaster, 29 August 2017 - 10:13 AM. Payment_201708-838.7z: Extracts to: Payment_201708-2866.jse - Current Virus total detections 14/59*. Payload Security**. Locky payload: (VirusTotal 31/65***). 9891613510.7z: Extracts to: 9891611187.vbs - Current Virus total detections 10/59*. Payload Security**. Locky Binary (VirusTotal 17/65***). These droppers have gone back to the old way of downloading Locky from the remote server, by downloading an encrypted text file that needs to be decoded by the script... The basic rule is NEVER open any attachment to an email, unless you are expecting it..."
natwest1753465723087_352.doc - Current Virus total detections 6/58*. Payload Security**. which downloads the zip file containing the .js file that eventually delivers Dridex. BT OneBill.zip extracts to: BT OneBill.js - Current Virus total detections 7/58*. Payload Security**. (VirusTotal 17/64)... The basic rule is NEVER open any attachment -or- link in an email, unless you are expecting it..."
This email attachment contains a genuine word doc [i]with a macro script that when run will infect you. Edited by AplusWebMaster, 30 August 2017 - 02:42 PM. 31 Aug 2017 - "... imitating NatWest Bank and using the same look-a-like domain as yesterday’s version... using a slightly different email message. They have even re-used the same domains to deliver the actual payload, but with different file names. natwest112543798124_21454.doc - Current Virus total detections 5/58*. Payload Security**. Account_Documents_31082017.doc - Current Virus total detections 10/58*. Payload Security**. http ://evaluator-expert .ro/sergio.png which of course is -not- an image file but a renamed .exe file that gets renamed to bicprcv.exe (VirusTotal 17/64***). Edited by AplusWebMaster, 31 August 2017 - 02:59 PM. http ://jakuboweb .com/dropbox.html but each email I received (so far 300+) has a multitude of different links. RIG EK IP address: 188.225.84.28 ..."
Edited by AplusWebMaster, 01 September 2017 - 09:57 AM. Locky download (VirusTotal ***). These all have a 7z attachment and a link-in-email-body to download the zip. The invoice amounts are random as well.... The basic rule is NEVER open any attachment or link in an email, unless you are expecting it..."
... AppRiver researchers explained*. The malware arrives in inboxes attached to emails with vague subject lines like “please print”, “documents”, “scans”, “images”, and so on, And, unfortunately for those who get infected, there are no publicly shared methods to reverse this Locky strain. The crooks behind this malware campaign are asking 0.5 Bitcoin to deliver the decryption key..."
Each message comes with a ZIP attachment that contains a Visual Basic Script (VBS) file that is nested inside a secondary ZIP file..."
Edited by AplusWebMaster, 04 September 2017 - 09:41 AM. SCNMSG00002704.7z: Extracts to: Invoice INV-000518.vbs - Current Virus total detections 13/59*. Payload Security**... The basic rule is NEVER open any attachment or link in an email, unless you are expecting it..."
leading to Locky ransomware. There is -both- a malicious attachment and -link- in the body text. The name of the sender varies. McHost is such a well-known purveyor of toxic-crap* that I recommend you block -all- of their ranges (plus I guess the related VDSINA ones), or even block-the-entire Webzilla AS35415**. You can find a list of the network ranges here**. Also thehost .ua also has a lot of crap*** and I would lean towards blocking-whole-network-ranges****. Edited by AplusWebMaster, 05 September 2017 - 01:33 PM. All of the compromised sites in these emails will download or try to download from this address. That creates a randomly numbered eBay_Invoice_.js file. The first 5 or 6 attempts gave me a 0 byte empty file until a working one was delivered... The basic rule is NEVER open any attachment or link in an email, unless you are expecting it..."
Edited by AplusWebMaster, 06 September 2017 - 08:07 AM. leypart .su: > https://check-host.n...host=leypart.su- ?? Edited by AplusWebMaster, 07 September 2017 - 03:07 PM. http ://storiteller .com/3f3geuf.exe (VirusTotal 11/59*) (Payload Security**)... 'not certain if actually running the .js file will deliver the payload or whether the malware devs have messed up. http ://ruisi .fr/ddokslf.exe (VirusTotal 10/65) (Payload Security)... 'really difficult to work out the payloads, when the .js files are created on the fly... The basic rule is NEVER open any attachment or link in an email, unless you are expecting it..."
They use email addresses and subjects that will entice a user to read the email and follow the link. HJGFjhece3.exe (VirusTotal 10/63) (Payload Security). I cannot work out if this is Trickbot or Locky today so far. The behaviour so far seen doesn’t exactly match either malware. It might be damaged or not working properly or some sort of anti-sandbox /VM protection to it. My gut feeling is -Trickbot- based on similar behaviour over the last few days when run in a sandbox or VM... The basic rule is NEVER open any attachment -or- link in an email, unless you are expecting it..."
Sep 14, 2017 - "The U.S. Federal Trade Commission said on Thursday it was investigating Equifax Inc’s (EFX.N) massive data breach, a rare public confirmation... Confirming what many cyber security experts expected, Equifax said late on Wednesday that hackers used a flaw in its open-source Struts software, distributed by the nonprofit Apache Software Foundation, to break into its systems. A patch for the vulnerability was issued in March, two -months- before Equifax said hackers began siphoning data..."
Sep 14, 2017 - "Credit reporting company Equifax Inc blamed a web server vulnerability in its open-source software, called 'Apache Struts'*, for the recent data breach that compromised personal details of as many as 143 million U.S. consumers. The massive data breach had exposed valuable information to hackers between mid-May and July... Cyber security experts said it was among the largest hacks ever recorded and was particularly troubling due to the richness of the information exposed - names, birthdays, addresses and Social Security and driver’s license numbers. Equifax said it is determining with the assistance of an independent cybersecurity firm what exact information was compromised during the data breach..."
Edited by AplusWebMaster, 20 September 2017 - 05:47 PM. Sep 18, 2017 - "... Piriform – the company that develops CCleaner and which has been recently acquired by AV maker Avast – has confirmed* that the 32-bit version of the v5.33.6162 of CCleaner and the v1.07.3191 of CCleaner Cloud were affected..."
Sep 18, 2017 - "We recently determined that older versions of our Piriform CCleaner v5.33.6162 and CCleaner Cloud v1.07.3191 had-been-compromised. We resolved this quickly and believe no harm was done to any of our users. This compromise only affected customers with the 32-bit version of the v5.33.6162 of CCleaner and the v1.07.3191 of CCleaner Cloud. No other Piriform or CCleaner products were affected. We encourage all users of the 32-bit version of CCleaner v5.33.6162 to download v5.34 here: download**. We apologize and are taking extra measures to ensure this does not happen again..."
Sep 18, 2017 - "... Talos recently observed a case where the download servers used by software vendor to distribute a legitimate software package were leveraged to deliver malware to unsuspecting victims. For a period of time, the legitimate signed version of CCleaner 5.33 being distributed by Avast also contained a multi-stage malware payload that rode-on-top of the installation of CCleaner... Given the potential damage that could be caused by a network of infected computers even a tiny fraction of this size we decided to move quickly. On September 13, 2017 Cisco Talos immediately notified Avast of our findings so that they could initiate appropriate response activities..."
Payload Security***... The basic rule is NEVER open any attachment to an email, unless you are expecting it..."
.7z files are popular with the bad guys pushing -Locky- at the moment. Blocking them at your mail perimiter may help. Edited by AplusWebMaster, 19 September 2017 - 08:00 AM. | downloads an encrypted txt file which is converted by the script to vtifOYBP.exe (VirusTotal 30/64***)... The basic rule is NEVER open any attachment to an email, unless you are expecting it..."
A2178050-11.rar: Extracts to: 20080920_757068.vbs - Current Virus total detections*. Payload Security**. Conclusion: Supply chain attacks seem to be increasing in velocity and complexity. It's imperative that as security companies we take these attacks seriously. Unfortunately, security events that are not completely understood are often downplayed in severity. This can work counter to a victim's best interests. Security companies need to be conservative with their advice before all of the details of the attack have been determined to help users ensure that they remain protected. This is especially true in situations where entire stages of an attack go undetected for a long period of time. When advanced adversaries are in play, this is especially true. They have been known to craft attacks that avoid detection by specific companies through successful reconnaissance techniques. In this particular example, a fairly sophisticated attacker designed a system which appears to specifically target technology companies by using a supply chain attack to compromise a vast number of victims, persistently, in hopes to land some payloads on computers at very specific target networks..."
Edited by AplusWebMaster, 21 September 2017 - 11:50 AM. ... All these recent attacks have used .7z archive files which would require 7zip or a compatible program to unarchive. Most decent mail filtering tools should be able to block -or- strip this extension, more clever ones would be able to determine that there is a .vbs script in there and block on that too." | drops 1102.exe 298.0 KB (305152 bytes) - VirusTotal 14/65 - Payload Security. moroplinghaptan .info/eroorrrs post request (giving a 404) shown in the Payload Security report. This has been a strong Indicator-of-Compromise (IOC) for Locky recently. > Update: I am reliably informed that it depends on your IP address and location what malware you get. You will either get -Locky- Ransomware or -Trickbot- banking Trojan embedded inside the .js file. The basic rule is NEVER open any attachment or -link- an email, unless you are expecting it..."